Indulge Nourish Sustain: Chocolate Heaven.. gluten free, dairy free and no added sugar.. Bliss! Chocolate Heaven.. gluten free, dairy free and no added sugar.. Bliss! So we had a friends birthday lunch at my house the other day and I was determined to put on a tasty, healthy gluten free lunch. 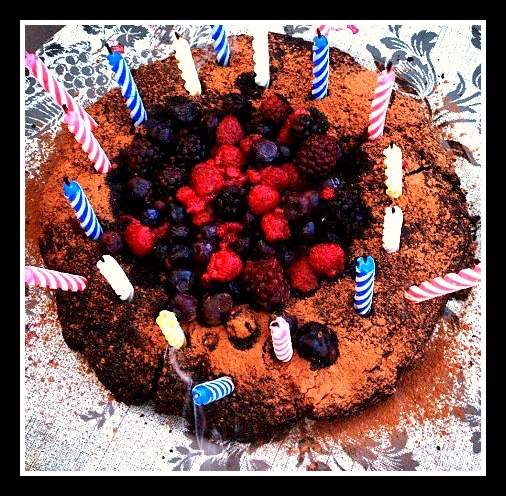 Of course every birthday party has to have a cake so I nipped this one off one of my favourite blogs.. Lexie's Kitchen. This was my first attempt at gluten free baking so I was dubious, but the pictures on her blog just look so damn amazing that I had to give it a go! The ingredients are unusual, but incredibly easy to put together. The worst thing about birthday cakes is that its near impossible to have a sneaky taste before everyone else gets to try it.. but thankfully this cake turned out to be one of the best gluten free cakes I have ever tried! It is extremely rich and dense so only small serves are necessary, which is good because the cake comes out quite petite and doesn't rise much. If you want it a bit bigger I would recommend doubling the recipe. I used a tube pan for my cake and filled the hole up with mixed berries. It would have been great with strawberries but they were out of season. The surface wasn't very smooth so I sprinkled some pure cocoa on top. You could also use gluten free icing sugar. Creamy icing might be a bit too much but that's just my opinion, otherwise fresh cream would work a treat if you are able to eat dairy! Well here it is kids, let me know how it works for you or if you have any exciting variations! Combine together and heat until chocolate is soft.. Blend all ingredients in a high powered blender until combined. Add 1 Teaspoon Baking Powder. Blend until mixed through . Poor into a greased and lined pan.